The Abexceed Folding Treadmill has all the perks a beginner would need from an electronic treadmill, with the bonus ability of being foldable to save space. If you’re looking to shed some extra pounds or you want to stay fit and healthy at home, the Abexceed can be a great choice. With a compact foldable frame and a fairly lightweight structure, you won’t have to worry about a burdensome, heavy and conspicuous treadmill taking up space in your house or apartment. Simply fold and tuck the treadmill away or leave it standing for easy use. 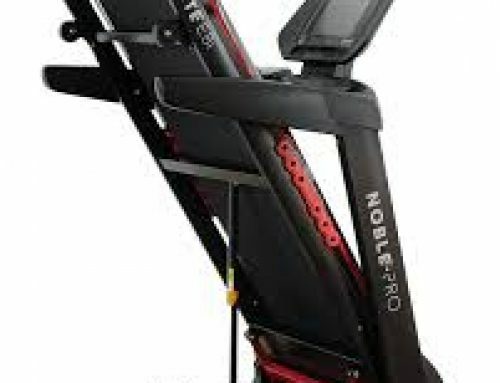 With that said, the Abexceed is not for everybody and it does not neatly fold away entirely; here we run through the features of the Abexceed Folding Treadmill. With a smooth motor energy of 1.75 HP and 12 pre-set speed classes between 0.8 and 12.8Km/h, the Abexceed Folding Treadmill offers decent variety and speed for the beginner and intermediate runner. With a three-level incline mode, you can test your limits intermittently or set yourself up for a full-on sprint, depending on your needs. A recommended cardiovascular run for beginners is around 7Km/h, meaning there is plenty of progress and speed settings for the most competent of runners. What’s more, it is controlled by a neat LED display pad with quick speed buttons, information on calories burnt and a pulse sensors for monitoring your heart beat. The easy to use controller is perfect for first timers, operating with clearly labelled buttons that mean you won’t need to frantically look through an instructions booklet to get started. In short, you get just about everything you need for a well-paced and variable workout, with settings which meet the industry norm. Given the low price of the Abexceed, the premium addition of hand pulse sensors is a nice touch. The Abexceed Folding Treadmill has a special drinks holder for long workouts, to prevent spillage or interruptions to your exercise routine. Its most unique feature, however, is the built in MP3 player. This allows you to plug in a portable device containing MP3s or other audio files for playback via an AUX cable on the treadmill’s own speakers. Given that most treadmill users will be familiar with using a portable smartphone or iPod paired with headphones, the built-in speaker system will be something of an unnecessary novelty for many. However, it is a unique and interesting system nonetheless, and is best suited for runners who prefer not to have any headphones in during their workouts. With a snazzy red frame and an attractive LED panel, the Abexceed is a sleek looking treadmill. 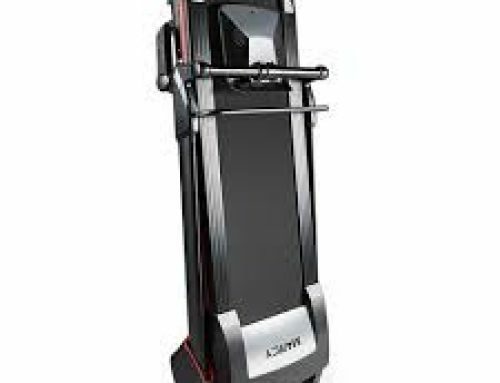 Measuring 1440mm x 620mm x 1150mm, it has a fairly average frame design size and a decent treadmill width for balance. Folding the treadmill is simple due to its quick folding system, reducing the overall size to 660mm x 620mm x 1280mm. With wheels built into the base of the treadmill, you can then cart it over to a corner of your room so as to save space. It is particularly effective at being laid against or placed next to a wall. Folding away is a unique and easy touch, but it does not fold the machine down completely. However, with more super compact treadmills, you lose the motor ability and functionality of a treadmill like the Abexceed. Lightweight and Compact: Being easy to fold and wheel away, this treadmill is ideal for those short on space. Its lightweight frame makes this a breeze. Easy to Use: Clear LED settings, quick access buttons and an intuitive controller mean that beginners will not be daunted by this treadmill. Hand Pulse Sensors: With the ability to monitor your workout, you can adjust and improve your cardiovascular routine regularly. 1.75HP Motor: Although the motor is efficient, it will not be able to keep up with faster paced, more experienced runners. 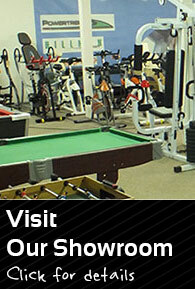 However, it is a perfect option for beginners and those looking for a daily cardio session. Incomplete Folding: Although the folding feature of the Abexceed is excellent for storage, those looking for an entirely compact/flat treadmill will not be happy with the fold. 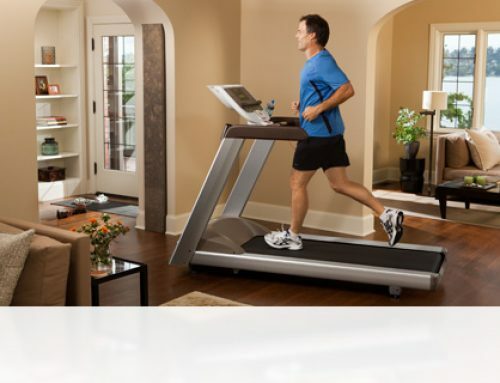 Average Settings: The incline and speed levels are just about average for an at-home treadmill. The Abexceed is a perfect entry level treadmill for beginners and regulars looking for daily exercise, and its unique MP3 playback and pulse sensors make it good value for money. It is easy to use, easy to program and easy to clean. It can be easily slotted away when it is not needed and is durable in the long term. More experience runners may be disappointed with the limited motor speed and settings if they are looking for very an intense, fast-paced workout. However, for its price, it has just about everything a beginner could need.